This year’s Student Government Association (SGA) elections for undergraduate and graduate executive positions have ended, with the president- and vice president-elects now beginning their transition periods. 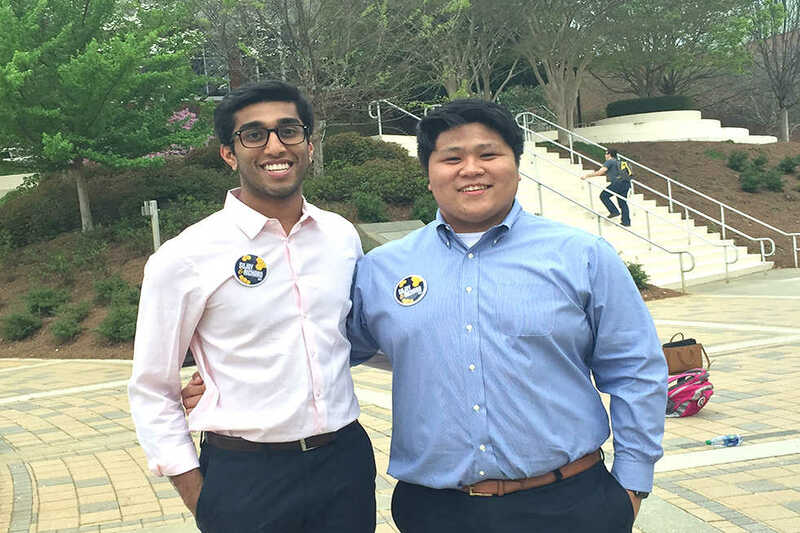 Sujay Peramanu and Richard Wang will be next year’s undergraduate student body president and executive vice president, officially entering office on the first day of finals. “I’m just extremely excited because SGA has given so much to me and I love giving back to the organization,” Wang said after results were announced on March 30. The runoff election between Peramanu/Wang and Lizzie Lisenby/Connor Brogan ended in the winners taking 51 percent of the student vote. 1529 students voted for Peramanu/Wang versus 1431 for Lisenby/Brogan, resulting in a net 2,960 votes. In the initial race, 3,258 ballots were casted with 1232 for Peramanu/Wang, 1,040 for Lisenby/Brogan and 985 for Leanne Francis/Apollo Liu; last year, turnout for the runoff election dropped off similarly, with 2,707 voting in the runoff versus 3,296 in the initial race. Peramanu and Wang ran on a platform addressing numerous facets of the student experience, including community engagement, sustainability, academic affairs, diversity and wellness. There were no serious elections code violations or sanctions placed on candidates during the runoff; reports of campaigning in the computer clusters, which could potentially violate the elections code if activity took place within 50 feet of the computers, were filed but unpublished. Graduate SGA elections ended on March 31. For the contested position of Graduate SGA president, Skanda Prasad won with 129 votes to Muhammad Fahad Razzaq’s 112. Vineet Ravi Tiruvadi ran uncontested for the position of vice president and ended with 162 votes. No violations were reported. Prasad, a third-year Ph.D. student in Electrical and Computer Engineering, ran on a three-pronged “vision” of advocacy on behalf of graduate students, resource improvements and collaboration with undergraduate SGA and departmental student organizations. He has served as a graduate student senator since Jan. 2015 and as vice president of Graduate Life since Sept. 2016. Tiruvadi is a fourth-year MD/Ph.D. student in Biomedical Engineering in the joint program between Tech and Emory. He has served as a graduate student senator at Tech since Aug. 2016, and as an Emory University senator since Aug. 2015. His platform aimed to ensure that graduate students are engaged, especially those whom “political uncertainties target,” and that services such as financial help, health care and academic assistance are readily available.